Morgan's Cooling Scalp Treatment is the perfect product to cool and soothe an irritated, dry or itchy scalp. It's formulated with wheatgerm which is rich in vitamin E, antioxidants and nutrients to moisturise and rejuvenate the scalp. It also contains beeswax to draw moisture to the skin to rehydrate a dry scalp. 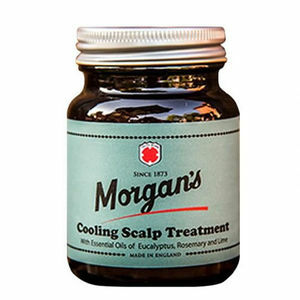 Alongside these is naturally healing sulphur, which helps treat scalp conditions by reducing sebum production and decreasing inflammation. There's also essential oils of eucalyptus, rosemary and lime for a cooling action and a great scent. Comes in a 100-ml amber jar. A great-smelling finishing fudge that offers light hold and adds moisture and definition to your clients' styles. Comes in a 100-ml tin. Hair gel that gives firm hold with the strength of a wax and is ideal for creating firm styles and spikes with a healthy-looking shine. Fabulous and great-smelling gents hair cream that nourishes and naturally controls all hair types. Comes in a 120-g jar that's made with 100% recyclable glass. An easy-to-apply matt paste that's ideal for creating simple, natural-looking styles for thinner, normal length hair. Comes in a 120-ml tin. Shaping wax that's scented with coconut and provides separation and definition together with a healthy shine.